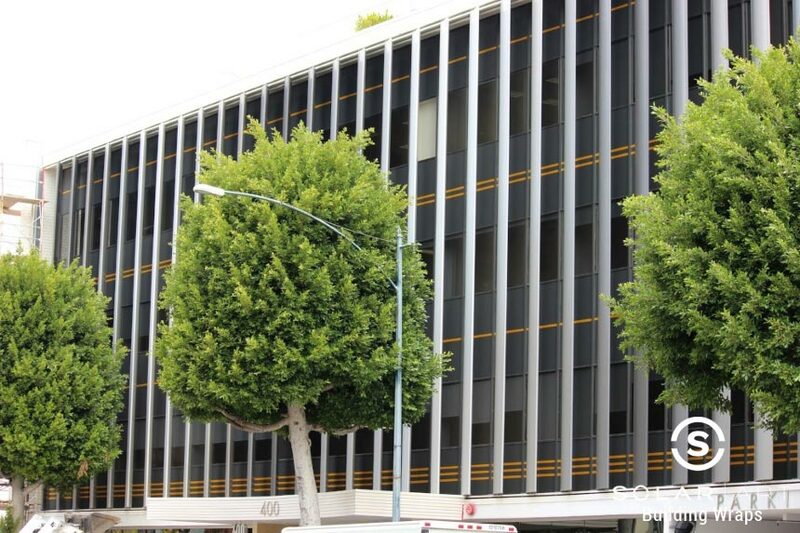 Solar Art installed a window vinyl building wrap to a commercial building in Beverly Hills, California! This customer noticed their building was one of the older looking buildings on the street and they were having a problem competing with the newer companies in the city. The customer was looking for a cost effective way to give their building a fresh new look. They looked into replacing the glass, painting the exterior of the building and more. They reached out to Solar Art to see what their window film options were. Our sales representative worked with them and found out that not only was appearance an issue, but so was heat, glare and privacy. Together, they decided an exterior building wrap with window vinyl was the perfect solution to solve all of the customers problems. Building wraps are a simple and affordable way to completely transform the look of a building. This customer was having a problem with afternoon glare preventing employees from being able to see their computer screens. The exterior window film Solar Art installed is a heat blocking window film, meaning it greatly reduces heat and reduces glare. Exterior window film is a type of solar film and can reduce up to 75% of heat that enters a space and blocks 99% of UVA and UVB rays. Privacy was also an issue.This particular company owned the entire building and the offices on the lower levels were having a problem with outsiders being able to see right into their offices. They originally tried blinds and shades to fix the problem, but they were unhappy with the with the fact that the building didn't have a uniform look from the exterior. The exterior window film that was installed prevents onlookers from being able to see in, while still allowing employees to see out and have some natural light enter the space. It also creates a completely uniform and clean look from the exterior. The window vinyl that was installed was for a decorative purpose. We worked with the architect and installed different vinyl stripe patterns and colors to give this building the extra pop to stand out against the newer buildings on the block. This particular customer decided to install the exterior window film with the window vinyl, but you can have one installed without the other. Solar Art has installed several offices with window vinyl for design purposes and vice versa. Just like solar film, anti graffiti film, security window film and decorative window film, both building wraps and window vinyl are removable with no damage to the glass if done by a professional! Interested in Window Vinyl & Building Wraps? Contact us directly to talk about window vinyl and building wraps! Exterior window film is a heat blocking window film that reduces heat, glare and blocks 99% of UVA and UVB rays. It also increases privacy! Contact Solar Art to learn more!